Yesterday was Palm Sunday, the beginning of the Holiest week for our faith. This week is sacred; not only to Christians, but to Jews, and especially to God. To the over 2.2 Billion Christians in the world, we are leading up to Easter, the celebration of Christ's resurrection. To the over 15 million Jews in the world, this is the week of Passover. But to God, is a foreshadowing of the relationship He would like to have with all of the nearly 8 Billion people on planet Earth. Through the Feasts He has instituted to be observed this week (Passover, Unleavened Bread, and Firstfruits), He is showing us the redemptive work of Christ as our Passover Lamb, as sinless and unblemished, and as the first of the resurrected into God's Heavenly Kingdom. So, it is with great sadness that we are witnessing the persecution of the followers of Jesus Christ during this most holy week on our calendar. The Syrian Civil War began six years ago, and Antoine Audo, the Chaldean Bishop of Aleppo reports that during this time of war, the Christian population in Syria has been reduced by two thirds, from 1.5 million to only 500,000 today --- from 160,000 to just 40,000 in Aleppo, alone. The persecution of Christians by Isis extremists has been horrendous; and the latest chemical attacks are a reminder of just how much evil is in the world. And as hard as it might be for us comfortable Americans to understand, Bishop Audo says the Assad government is not the source of Christian persecution. But Christians are caught in the middle of the battle between Assad and the anti-government rebels; between Al Qaeda and Isis; between the Russia/Iran partnership and the U.S.-led Western coalition. And it is all happening in Syria, who along with its neighbor Iraq, is deemed the cradle of human civilization and the region where Christianity began 2,000 years ago. It was on the road to Damascus that the Apostle Paul experienced his conversion to Christianity, and Syria remains one of the few sacred locales where the language of Aramaic – the language of Jesus – can still be heard. But Syria and Iraq are not the only places persecution is happening this Holy week. 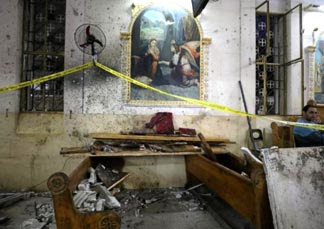 Bombings at Coptic Christian cathedrals in Egypt targeted Christians who celebrated Palm Sunday, the day of our Lord's triumphal entry into Jerusalem to observe the Passover Festival. It was the day that the crowds shouted their recognition of Him as Messiah, when they shouted, "Blessed is He that comes in the Name of the Lord. Hosanna in the highest". Hosanna means "Save, we pray", and in essence, they were shouting, "Please save (deliver) us, Son of David". I have no doubt that satan and his spiritual horde cringed at this tribute bestowed upon Jesus. They are aware of the prophecies in the Bible that predict that the Savior of man will come from the line of David. And just as the devil tempted the people and the religious officials to reject Jesus and His Deity during that Holy Week of approximately 33 AD, the Prince of this world is still trying to kill and destroy the influence of the Son of God, one thousand nine hundred and eighty-four years later. But here is what the enemies of Christ and His people will never understand... there is truth in the Biblical words, "To live is Christ, to die is gain". And here is what we comfortable Christians in America need to understand about the context in which those words were spoken by the Apostle Paul... he is in prison in the city of Rome, facing trial, knowing he's going to be executed for his faith in Christ. I'm going to say it again ... this is a man facing execution and death for his belief in Jesus Christ as the Son of the One True God. And yet he says, to die for Christ will be his gain. Are you prepared to say that? Would you still proclaim that if you had just watched your children die the horrendous death of chemical poisoning? Would you deny Him if a sword is held at the throat of your wife or husband? Because here is what satan and those who follow him do not understand about us Christians. Our faith is different. When asked, What is the difference between Life and Death, Buddhism says, "To live is to achieve good Karma, and to die is to hope for a better reincarnation." Islam teaches, "To live is to obey Allah, and if your good deeds outweigh your bad deeds, death is to achieve a personal paradise." Silicon Valley answers the question this way: "To live is self, and to die is loss." To all these other religions, Life is all about the self. And to die is to lose everything. But that's not what we Christians believe -- or should believe, if you are calling yourself a Christian. To live is to obey Christ and do what He did: serve others; show them the principles of His Father's Kingdom and how to live by those moral standards; and ultimately to sacrifice His own life for the sake of offering eternal life to those who would believe in Him and follow Him. Our faith is not about self! And if we are to die for the sake of Christ or another, then we have the hope of gaining eternity, and that is worth giving up self! It is important to grasp this point --- Even if we die in this life, we have the hope of eternity! So, I would like to ask for prayer this holy week for our fellow Christians; those who have already felt the pain of persecution; and for those who face the possibility during these remaining days leading up to the commemoration of Christ's resurrection. Pray for the Believers who are still in Syria and the Egyptian Coptic Christian communities, refusing to let the Enemy defeat them. Pray that they would be used as strong witnesses of Christ’s love to their fellow Syrians and Egyptians. Pray for the justice of Christ to draw the oppressed people of Syria and Egypt to Him. And pray for the relief of suffering for the persecuted Christians in North Korea, Somalia, Afghanistan, Iraq, Iran, Sudan, Yemen, Libya, Nigeria, and the remaining countries that make the World Watchlist of most persecuted countries. Father, Your Word tells us that persecution is part of our future, and we know that our time is coming. But, Father, right now, at this very moment, I pray for strength, and courage, and endurance as my fellow Christians around the world are demonstrating their genuine faith in my Lord and Savior. Deliver them into a supernatural protection by Your Power and Might. Let their spirits feel the power of our prayers, and let them know we stand with them in our shared faith. Father, this week shows Your amazing love for us, that You sacrificed Your Son so that we, who believe in Him, might not know the sting of death. I am trusting you, Father, that those who have suffered persecution because of His Name, will be rewarded in Heaven for their faithfulness, just as You are faithful in delivering them from the dominion of darkness on this earth into the Kingdom of Your beloved Son. And it is in His holy, powerful, and compassionate Name I pray. Amen. Hebrews 13:3 "Remember those who are in prison, as if you were their fellow prisoner, and those who are mistreated, since you also are in the body [and subject to physical suffering]".